There has been quite a bit of rain in August - fine for staying in the studio or at the writing desk, but a bit difficult for Miles and David who are filming or for painters wishing to go out au plein air - the air has been anything but plein! 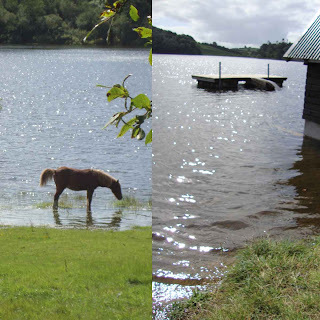 Just to give you an idea here are some photos of Annaghmakerrig Lake. You will see the floating jetty is now an island. I was going to take a photo of the water level gauge but couldn't find it - missing presumed drowned!